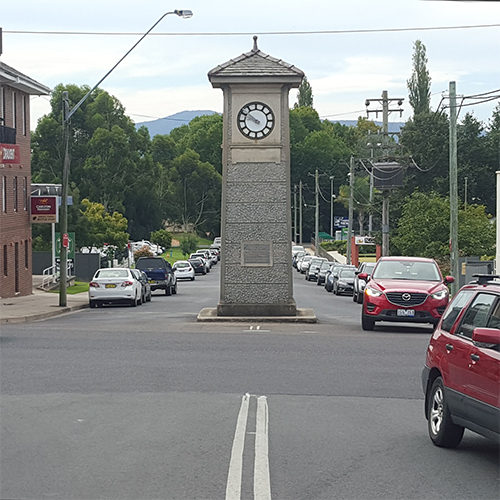 The decision to relocate the clock tower was made at a Council meeting in February following discussion of safety concerns for road users and pedestrians using the Gipps Street and Carp Street intersection. Manager of Community and Culture, Simon Schweitzer said that Councillors had identified a risk to the community and the resolution to relocate the clock tower reflects the best option for improving the busy intersection. “We understand the importance of this memorial and historical icon to Bega, so we are involving the community in this next part of the process,” he said. “If you have an interest in Bega, either as a resident or visitor, we invite you to tell us where you think the Bega Memorial Clock Tower should be located and why. “People wanting to comment are encouraged to read the agenda item from the Council meeting business paper before commenting as it provides a holistic view of the situation,” Mr Schweitzer said. To read the agenda, go to http://is.gd/bvscmeeting and look up item 11.1. There will also be a chance to have your say at a listening post from 10am to 1pm at the SCPA Market in Bega on Friday 1 April. Formal submissions can also be sent to council@begavalley.nsw.gov.au or PO Box 492, Bega, NSW 2550. Residents wanting to have their say online can go to www.begavalley.nsw.gov.au, click on ‘Have Your Say’ near the top of the screen and then click on ‘Consultations’. The survey will be open until Friday 8 April 2016.